The speaker at our group meeting on the 1st May 2018 was Dan Clarke, the Conservation Officer of APS NSW. Dan spoke to us about the importance of Australian native plants in his life and his developing interest in conservation. 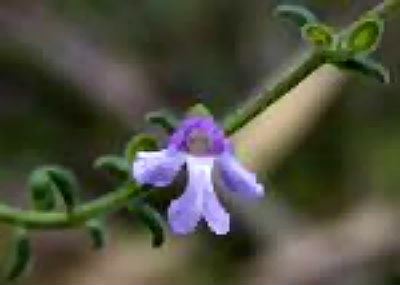 During his talk Dan reminded us that we have a number of endangered plant species in our area including Prostanthera marifolia, known as the 'Seaforth mintbush'. This species is listed as Critically Endangered by both State and Federal Governments as there is only one known stand and that is fragmented. P. marifolia was first described in 1810 and was recorded from around Middle Harbour in Sydney and on Mangrove Mountain, 100 km to the north. Early records from south of Sydney that had been identified as the Seaforth mintbush were later re-identified as P. densa. Further attempts to find P. marifolia were unsuccessful, therefore, the species was presumed to be extinct. The species was rediscovered in 2001 in the suburb of Seaforth in northern Sydney. Prior to urbanisation, this was probably a single population but is now considered to be fragmented into three sub-populations due to their small size and relative isolation being partially separated by developed areas. P. marifolia occurs on clay-loam soils associated with ironstone and scattered shale lenses, only found on ridge tops which have been extensively urbanised. The species occurs in close proximity to the endangered Duffys Forest Ecological Community and is found in woodland dominated by silvertop ash (Eucalyptus sieberi) and red bloodwood (E. gummifera). The threats facing the P. marifolia include habitat fragmentation, loss and degradation. Habitat loss is a threat faced by the two larger sub-populations. The species has undergone local extinctions and fragmentation over time as a result of urban development in central metropolitan Sydney. It is currently threatened by possible further habitat loss due to clearing and road widening for the proposed tunnel under Sydney Harbour. The loss of habitat as a result of the development of mountain bike tracks is also a threat. Unauthorised tracks are closed when detected but pressure to create new tracks is ongoing. I believe that P. marifolia is a species worthy of conservation and it is within our Group's competence to set up a project with this in mind. Any members who are interested in such a project, either on our own or in conjunction with Northern Beaches Council, OEH or another volunteer group, please contact me. We may be able to contribute something to keep this species with us for a long time to come. Unfortunately, I have no images of my own, yet. This one is from the OEH website. 'Telopea" Volume 15: 149 - 164. Published 1 Nov2013. Provides confirmation that P. marifolia is a separate species from its close relative P. densa, plus some good images. Other endangered or lost species include; Melaleuca deanei, Darwinia biflora, and Haloragodendron lucasii. I will be including information on these species later on. Two other endangered species; Acacia terminalis and Eucalyptus camfieldii are found on North Head and are being propagated and planted out by the volunteers at the North Head Sanctuary Foundation as part of their bush regeneration project. If you have any ideas, information or images concerning conservation that you think would be of interest to members, please send it to me for possible inclusion on this page. If you would like to become involved in a conservation project, let me know.